In a day of camera launches, Panasonic has left its trump card till last – the DMC-FZ28. Labelled as "super versatile" by Panasonic, the FZ28 houses what can only be described as a mega-zoom. Its Leica DC Vario-Elmarit 27mm wide-angle lens can zoom optically to 18x. And if you want to get extra close to that flower, bird, next-door neighbour's window (actually that last one would not be recommended) there's an Extra Optical Zoom function that takes your shots to a macro-tastic 32.1x – with no apparent pixilation! And it's not just zoom power that the FZ28 houses either. There's a high-sensitivity mode to tinker with that goes up to ISO 6400 and a burst rate at 13 frames per second. All this is captured on a cam that is equipped with a 10.1MP sensor. Panasonic yet again utilises Venus Engine IV for image processing. 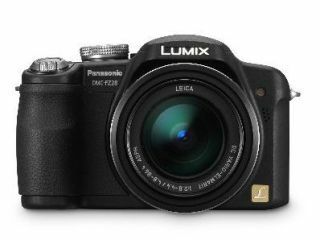 As with the majority of cams Panasonic has announced today, the FZ28 is packed with intelligence. There's iA (intelligence auto), AF Tracking and more accurate face detection, and images can be viewed on the camera's 'intelligent' 2.7in LCD screen. No prices have been announced as of yet, but you will be able to purchase the DMC-FZ28 in black or silver.